One plate of deliciousness, coming right up. 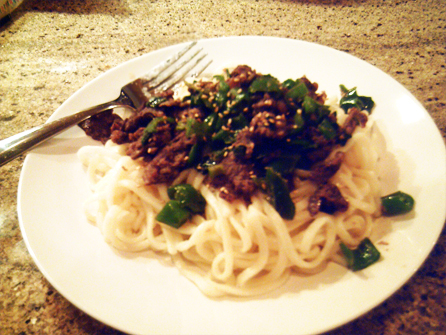 My first attempt at making Bulgogi (Korean-style bbq) over udon noodles with green peppers and green onions. It wasn’t bad. Not bad at all. 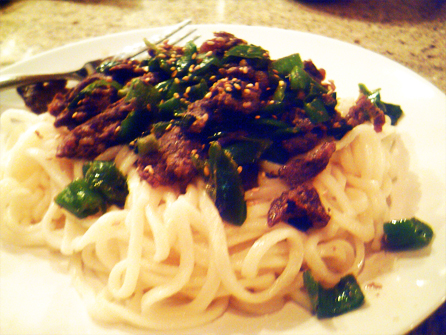 If cooking Korean food is something new to you too and you’d like to try it, check out maangchi.com for how-to videos for a large selection of Korean food recipes. You can search for Maangchi on YouTube as well. She’s fantastic.